When the weather is warm and pleasant, there is nothing more satisfying than eating a meal outside. 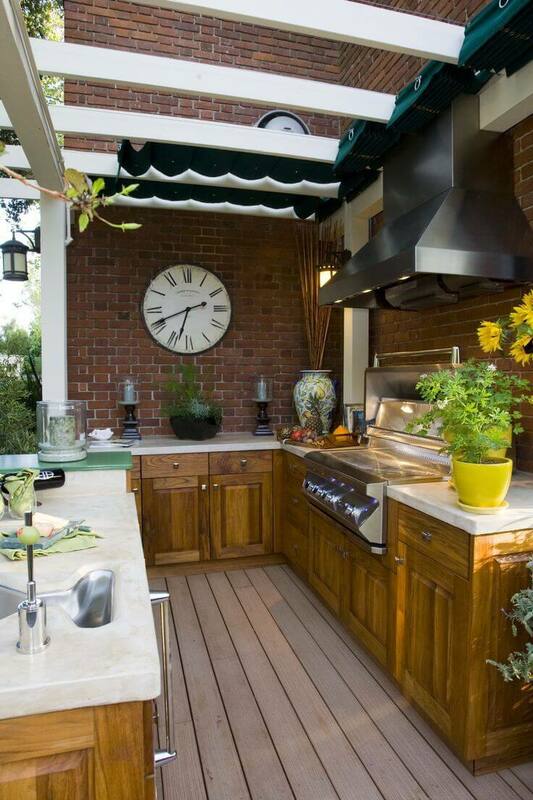 With these outdoor kitchen ideas, you can both prepare and enjoy your food under the warm sun or glittering stars. You will find designs for every style from shabby chic to rustic to outdoorsy glam. A dark wood pergola adds design and class to classic, adobe style stonework. This kitchen has a southwest flair with orange tones mimicking the desert and stainless steel offering a striking contrast. Darker red tile forms the countertops, and if you notice, brightly colored tiles give an unexpected pop of color. 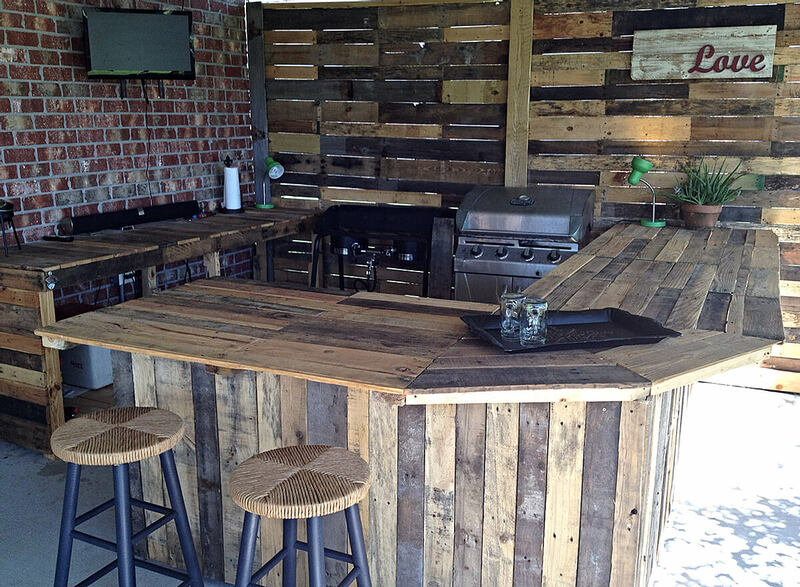 Add an outdoor sink and griddle, and you’ve got a full kitchen setup. Have you ever heard rain bounce off a tin roof? 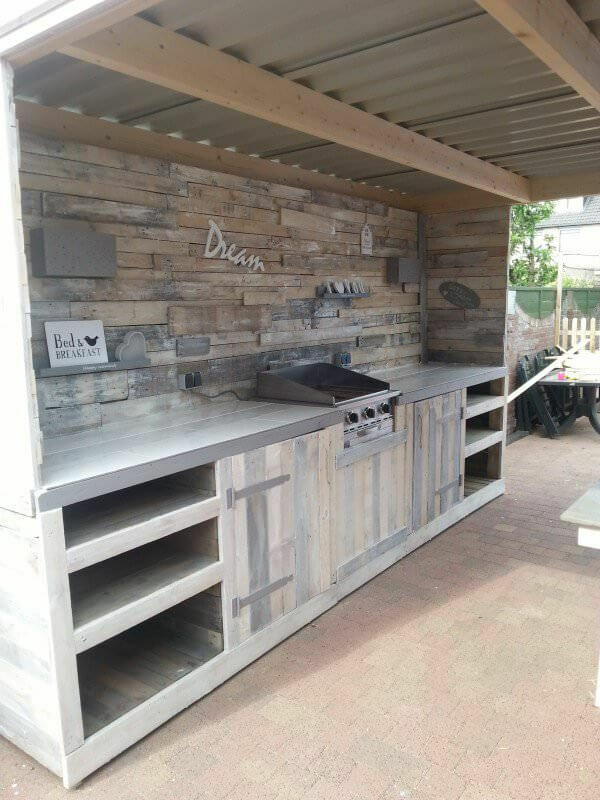 This outdoor kitchen takes that peaceful feeling and creates a casual outdoor space using the corrugated tin for visual interest and a beautiful soundscape during stormy weather. Keep things from getting too fussy with oak-toned wood accents including countertops, plus a string of outdoor lights across the top. 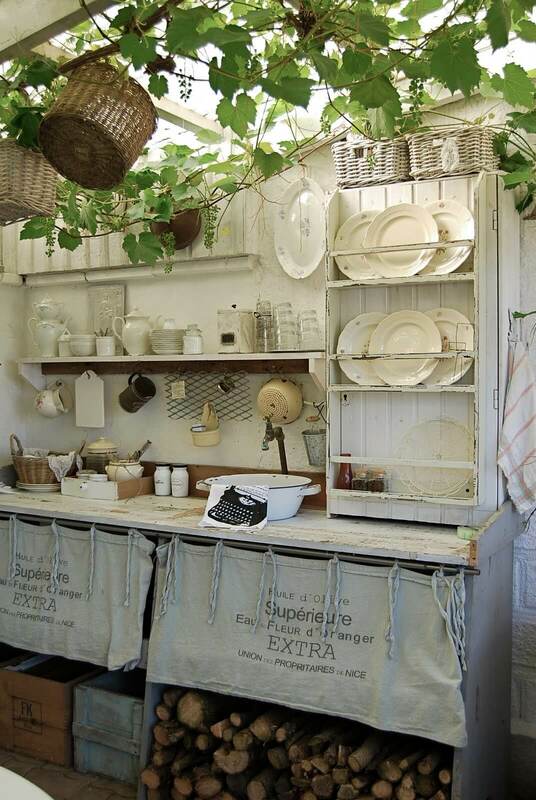 Shabby chic kitchens are still a classic, and this shabby chic inspired outdoor kitchen is no different. It uses whitewashed brick for a comforting aged look, plus neutral gray accents on the counter. Also, did you notice the chevron brick floor? It pairs nicely with the stonework below the bar. 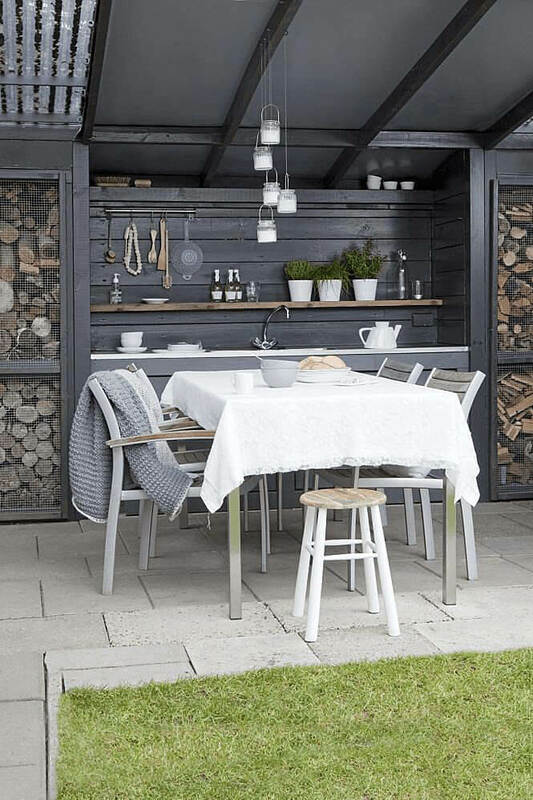 This minimalist outdoor kitchen is low fuss but high style. 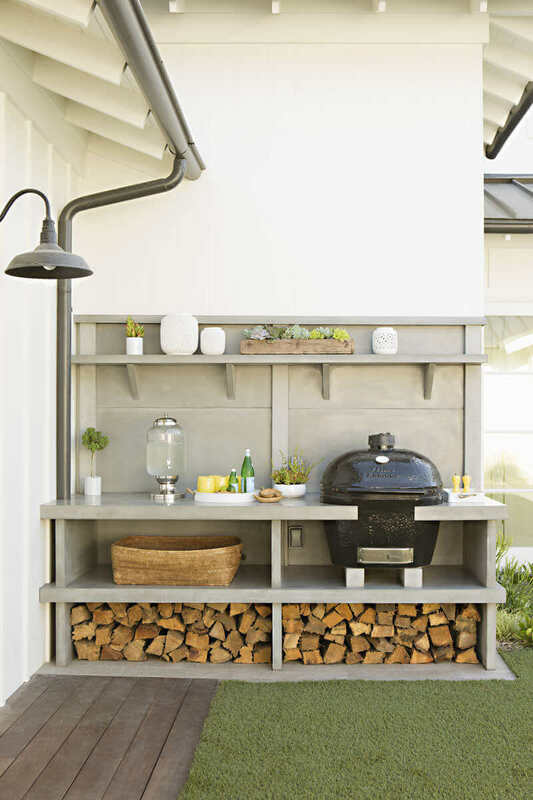 A ceramic smoker style grill and a glass water dispenser are the focal points of simple, open shelving in a soft grayish brown. 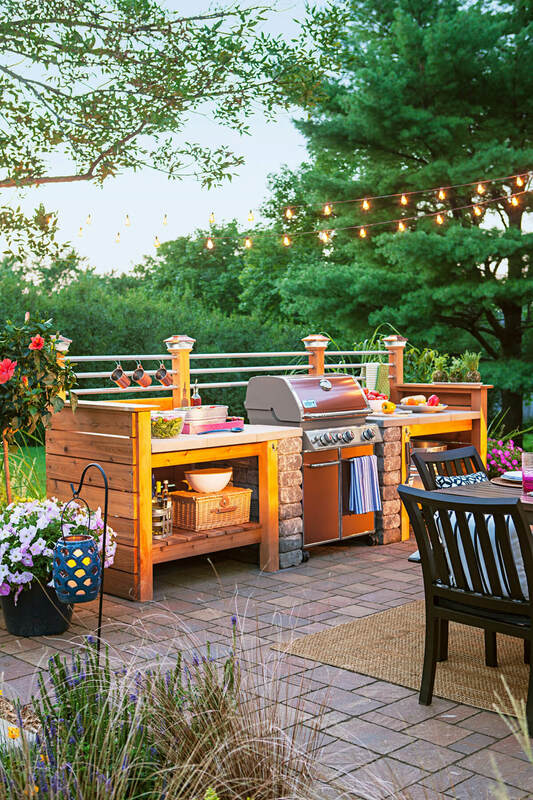 Keep decorations to a minimum so that the graphic shapes of the grill and water dispenser stand out, and it doesn’t hurt to add a touch of plant life. 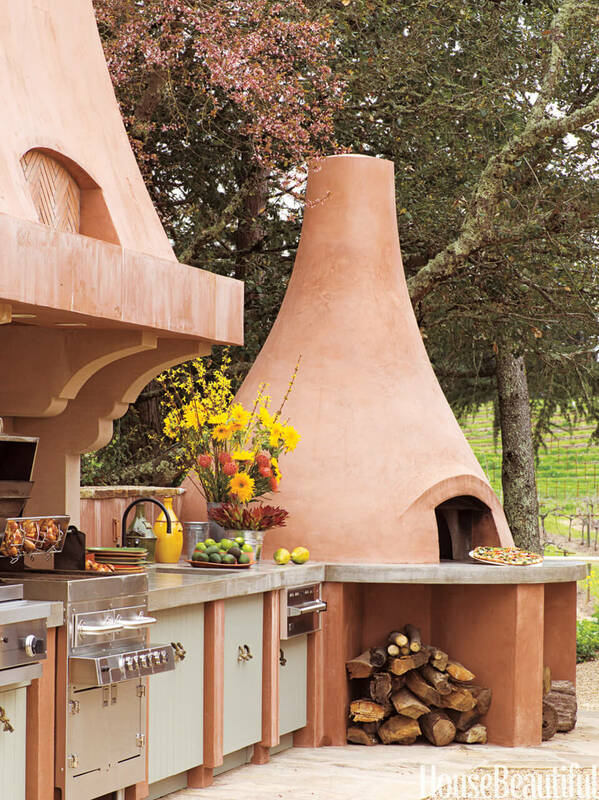 This is another southwest style kitchen, but this time with everyone’s favorite appliance: the pizza oven. Adobe adds warmth and gives the stainless steel appliances a subtle golden glow. The oven is large enough for multiple pizzas plus wood storage below. Enclose the kitchen area with adobe eves to give it a finished feel. 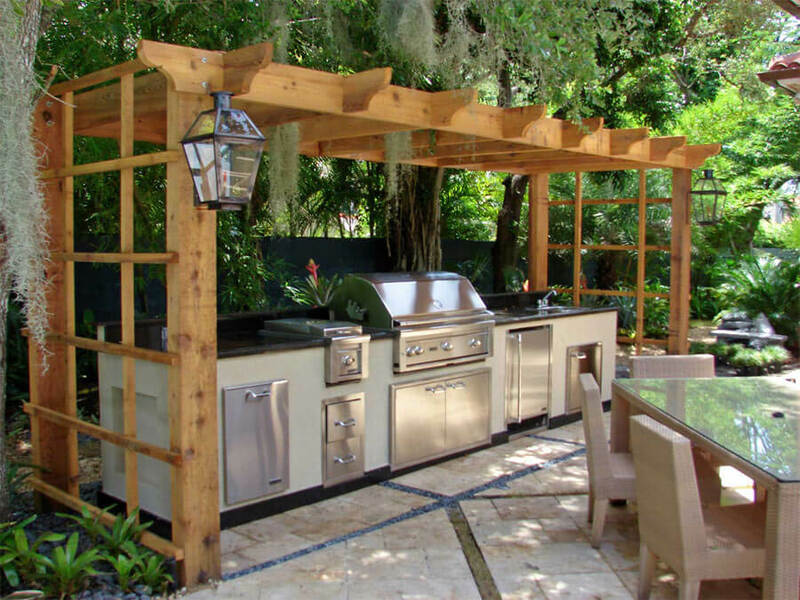 An open pergola encloses this full kitchen setup and gives it a formal feel. Light wood beams are a natural complement to the off-white base and dark countertops. Stainless steel appliances are a luxe addition to these simple colors, and the entire set-up is well balanced and a little traditional. Gray wood gives this kitchen a farmhouse feel. Decorations are at a minimum, but with a couple of small shelves set into the rock wall, you’ve got a few places to add some beloved accessories. Open shelving on either side of traditional barn door style cabinets adds visual interest and balance without being cluttered. 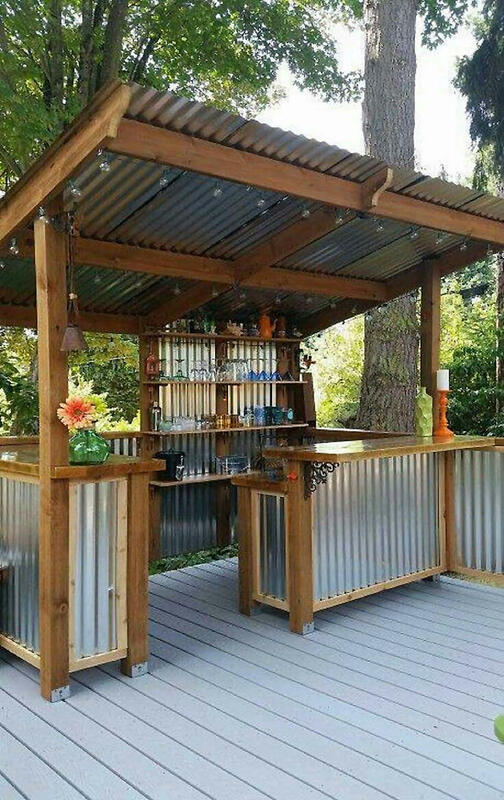 A quaint tin roof finishes the look. 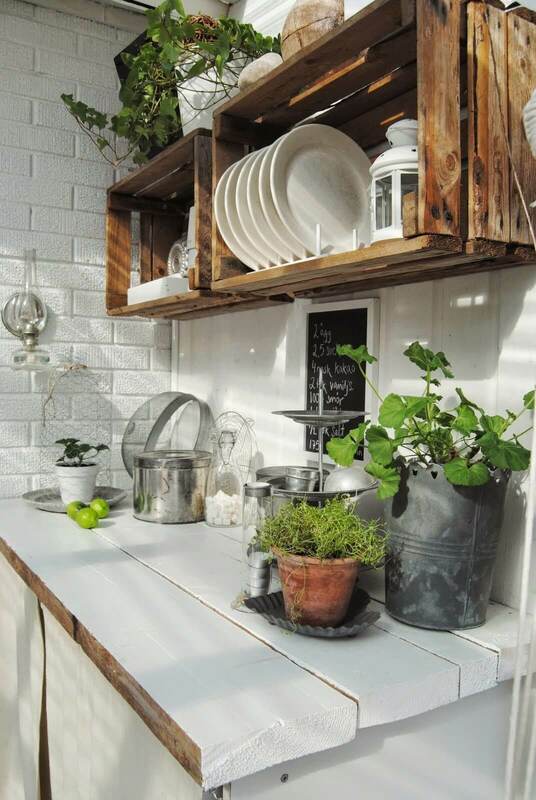 If you’ve already got the grill in place, but need an area for prep and staging, use crates for an easy set of shelving. Smaller crates can hold plates and dishware until guests are ready. You can use the interior for dining essentials and the top for some plant life. This setup is a full-scale outdoor dining space. It gives you an extra deep counter top for preparation and serving. Guests can sit with the cook as the food is prepared. The counter is a formal granite style counter on top of neutral aged stonework. On the other side of the grill, the cook has access to a sink and a mini-fridge. In another minimal design, open shelving provides visual interest plus tons of storage for all your outdoor equipment. Neutral whitewash complements a bright cherry deck and doesn’t hinder the view beyond. It’s perfect for stacking wood for the smoker and an outdoor sink rounds out the amenities. Guests love an indoor space that opens to the outdoors. You can provide access to the kitchen during parties with this open bar style space. A long counter extends from the interior to the exterior, opened with classic French style windows. The space is defined with wooden shingles that make things comfortable and homey. 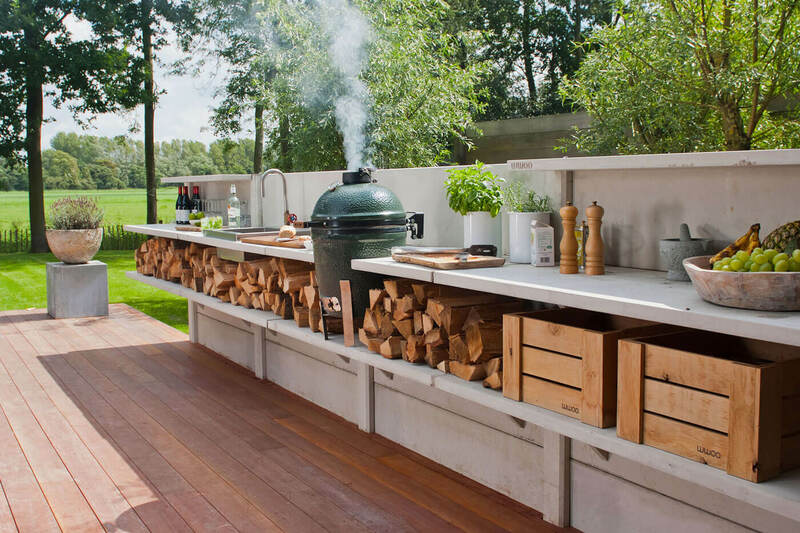 Outdoor kitchens don’t have to be elaborate. 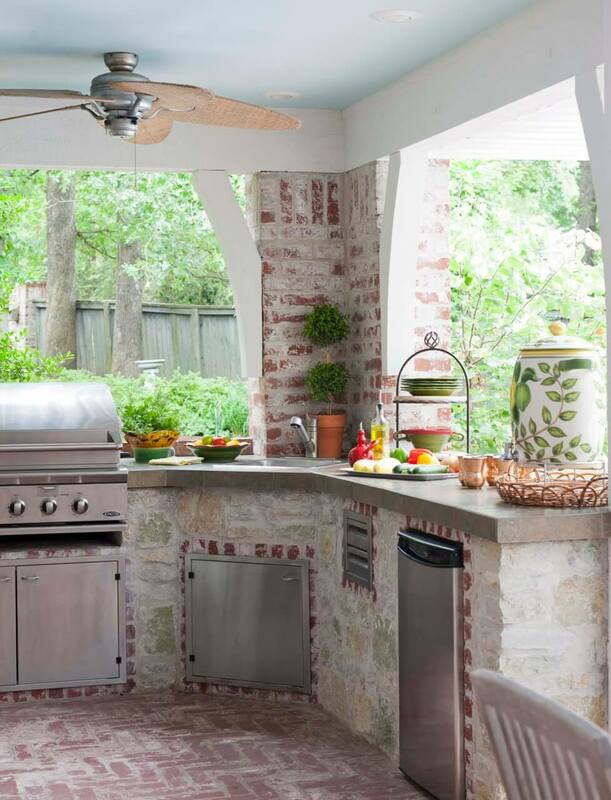 In this space, wood and simple brick complement the small space, providing prep areas and a base for the grill. Warm tones of wood give it a comfortable family room feel. Bars across the back finish the look with extra hanging storage for utensils and cups. 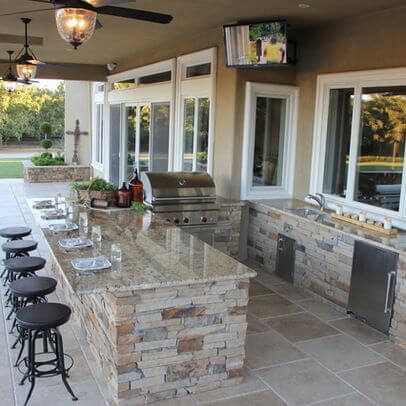 Stone is a classic outdoor kitchen staple, and this simple masonry provides a built-in base for the grill, sink, and mini-fridge. The table complements the color of the stone and encloses the entire space as an outdoor dining area with plenty of seating. It’s well balanced and warm. This is country with a modern twist. Changing things up with darker wood gives it a glamorous touch, but the barn-style lights and rope cabinet handles bring the flavor of country-style. Blonde wood countertops provide balance and minimal decorations aside from a bit of plant life keep things clean. Reclaimed wood has such personality. Using reclaimed wood for the countertop and base gives visual interest, while the different wood tones complement each other. The wrap around counter offers guests plenty of room to talk with the cook without crowding the prep area. Simple raffia barstools finish the casual look. 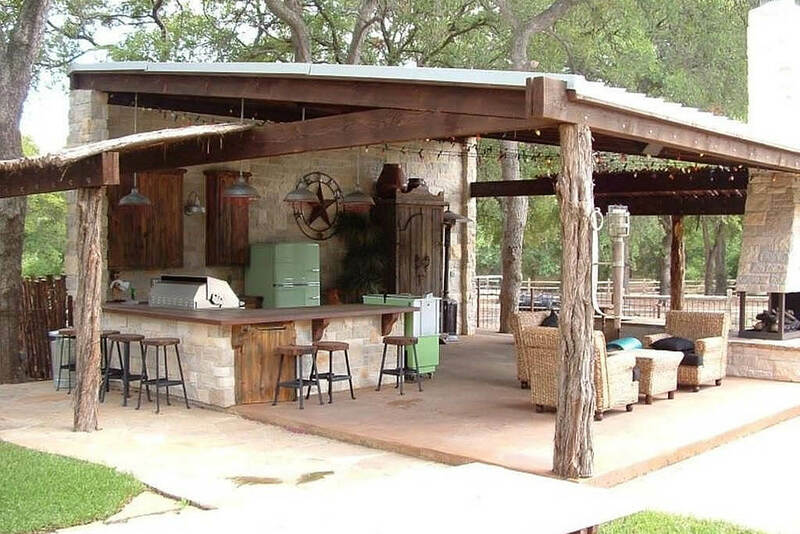 If you’re doing a complete outdoor redo, go big with this luxurious poolside kitchen. The bar is a pleasing curved design that mimics the lagoon style pool. Warm stone keeps things comfortable with the dual-layered bar. 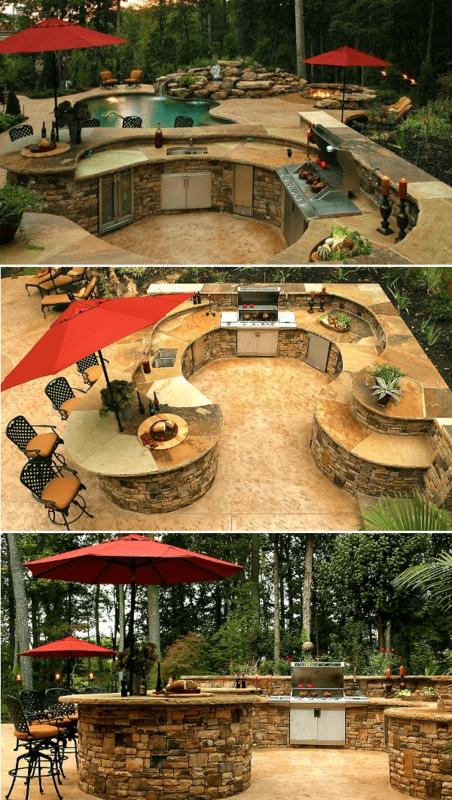 A red umbrella finishes the look and provides valuable shade for summer days. Outdoor living rooms are the best places to spend summer nights. 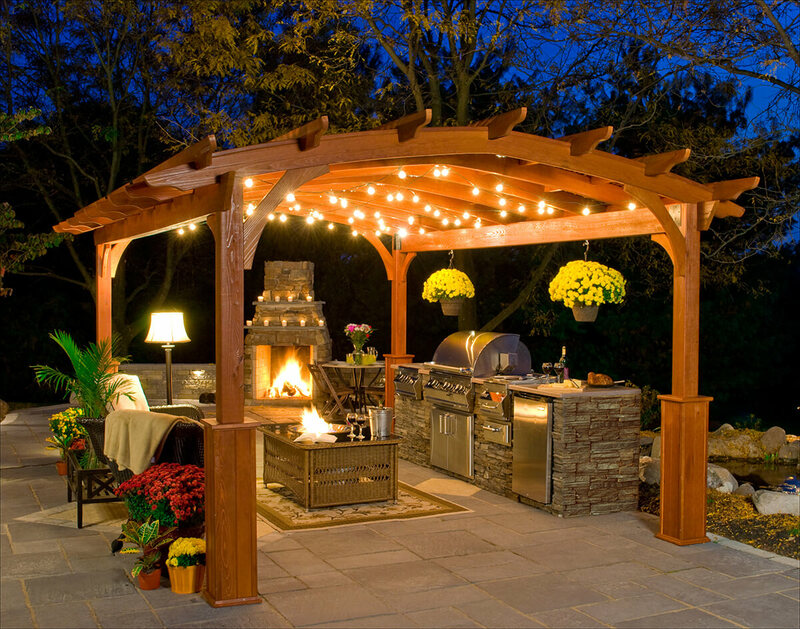 A giant arched pergola helps to define this outdoor space and make it feel like a real room. 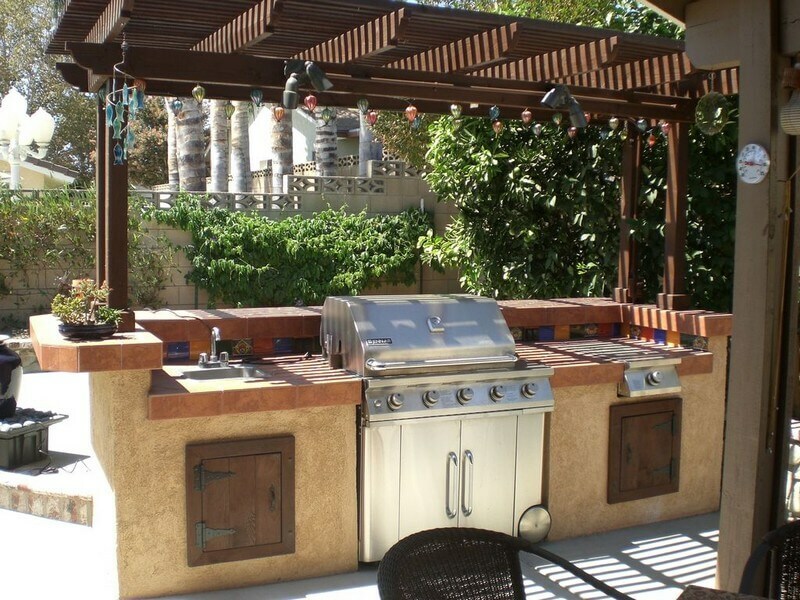 Add an outdoor couch and coffee table across from the grill so that the cook can be part of the gathering. A fireplace adds beauty and comfort as a final touch. A retractable awning provides shade on bright days but opens up to the stars on clear nights. This space is a more traditional style with clean dark wood and white countertops. Brick brings warmth to the galley style kitchen and stainless steel brings a bit of luxury. Finish the look with formal accessories. This rustic space is its own separate living area. 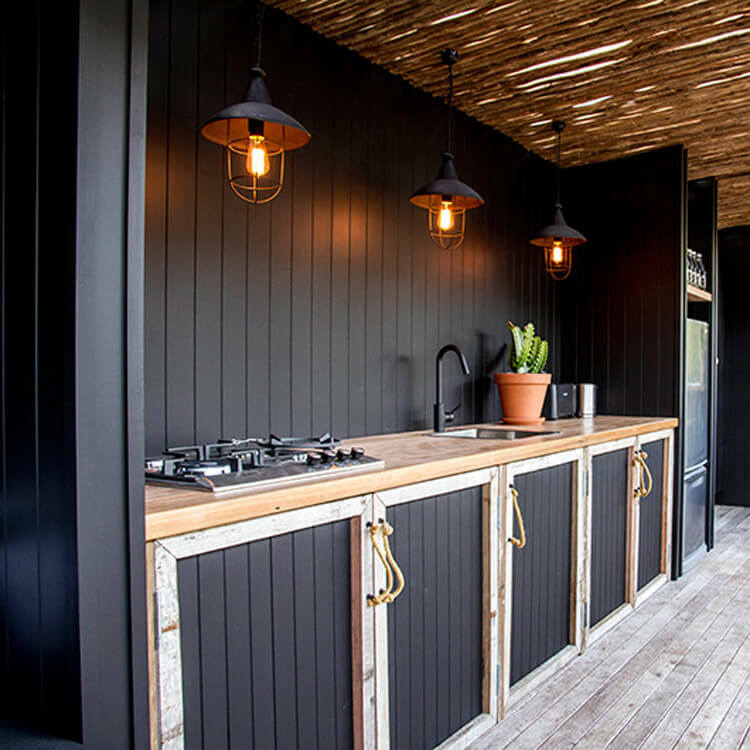 An extensive patio and roof using reclaimed wood and a corrugated tin roof give ample outdoor square footage for parties and gatherings. Guests can sit around the wraparound counter or in the seating area with the fireplace just to the side. The look is complete with sweet vintage appliances such as the olive 50s style refrigerator and an armoire. 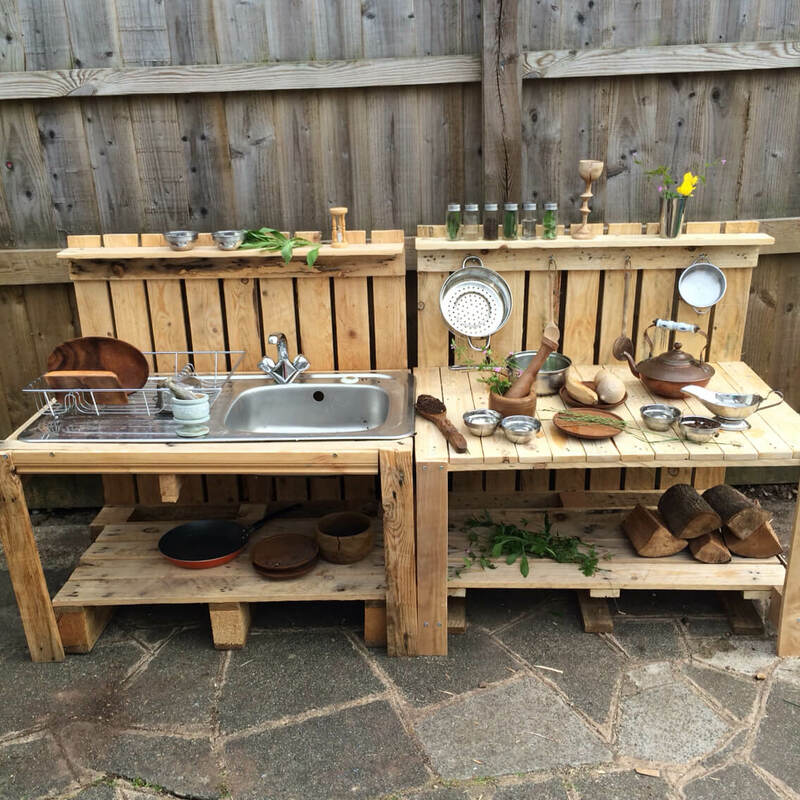 Mimic your childhood mud kitchen by using pallets to create a simple counter and food prep station. 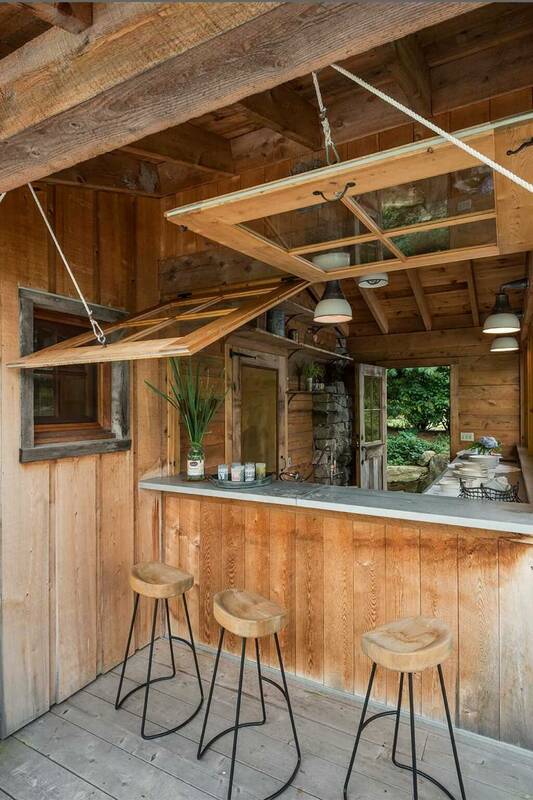 It’s a rustic take on outdoor built-ins, but unfinished, light wood gives the space airiness. It’s casual and fun. It offers plenty of storage below for large accessories, and the small shelf across the top holds a few essentials like spices. This is another indoor/outdoor space. 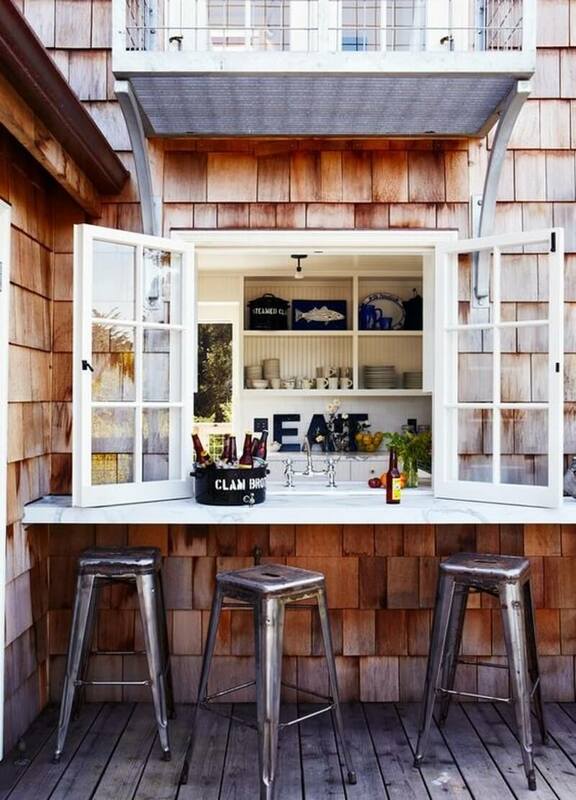 On beautiful days the windows open up to the outdoors and give guests space to lounge close to the grill. When things get cold or windy, let the windows down, and you’ve still got your grill space. The space has a rustic edge, using natural woods and a neutral stone countertop. Slate is a luxurious look for this outdoor space. It creates a focal point above the grill and sink using a stone arch for visual interest. 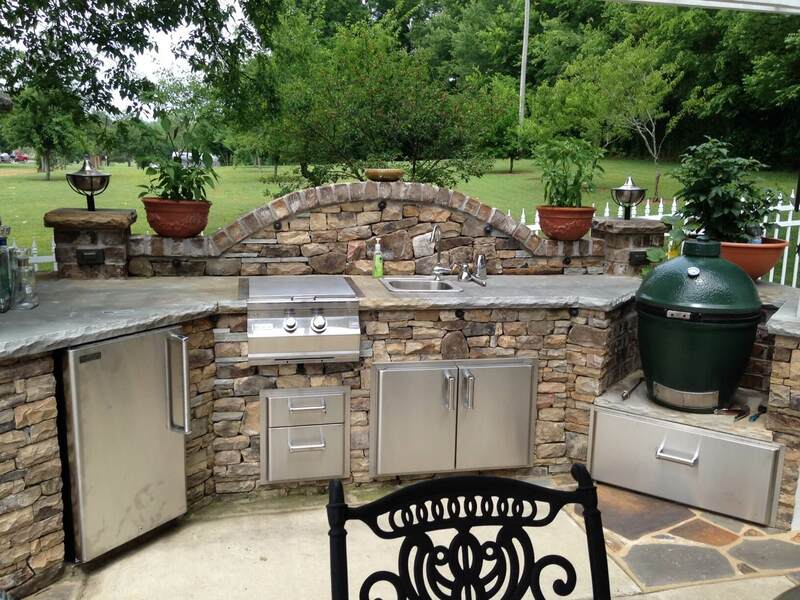 On either side, there is enough countertop for food prep, and on one side a deep green smoker rounds out the formal design. Accentuate the design with deep green potted plants. 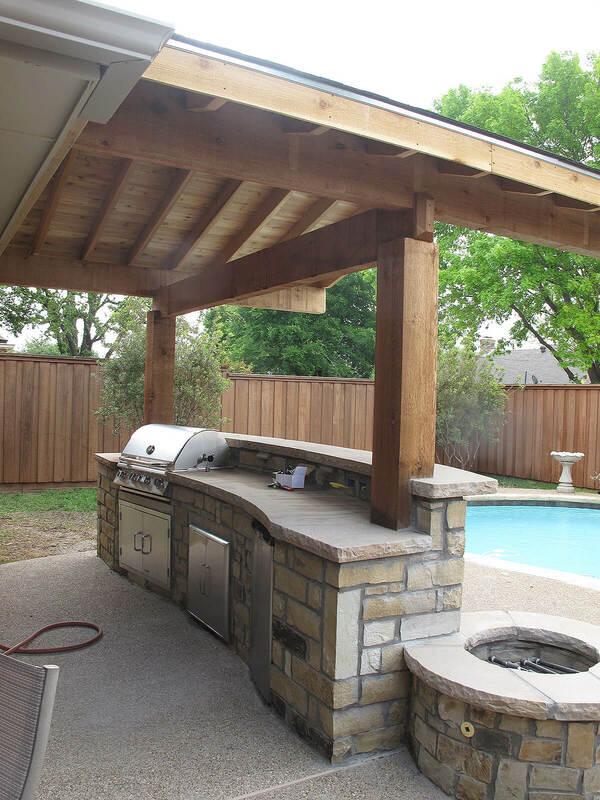 This space uses formal stone to define the grill area plus gives guests a fire pit to warm up after a dip in the pool. The stonework is a simple geometric design that accentuates the rough cut stone countertops. 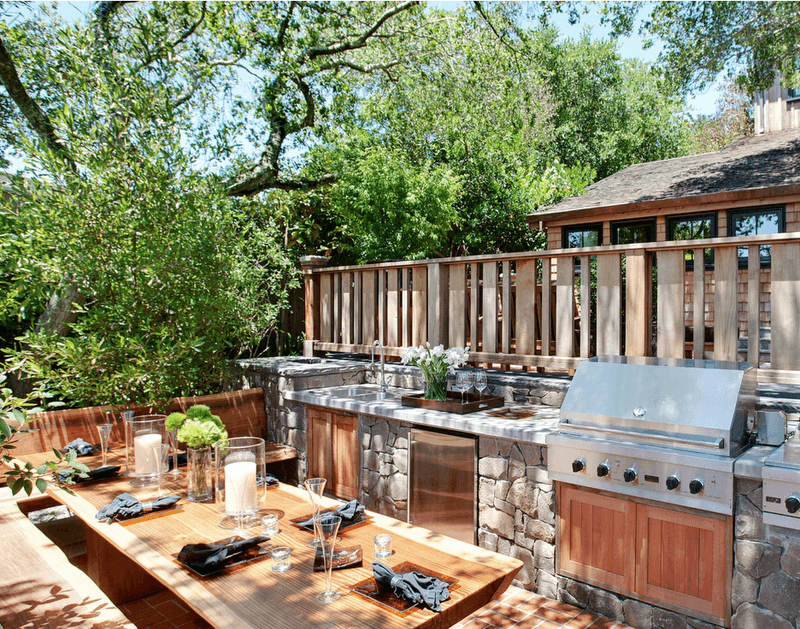 Both the stainless steel grill and the oak-tone wood roof provides solid complements to the formal plan. Keep the space free of clutter so that you’re free to enjoy the craftsmanship. This shabby chic space uses reclaimed wood in whitewashed colors to give a clean but sweet feel. Open shelving provides space for you to show off your set of vintage dishes, but bottom shelves are hidden with French sack curtains. Just below is storage for wood. Put hanging storage on the shelves for your utensils and group like accessories together for a whimsical feel. If you use a lot of wood during the year, build a floor to ceiling storage space. This dark wood prep station is a modern country kitchen design. Wood storage on either side is enclosed with wire mesh so you can see the shapes of the wood. The countertop and shelves are blonde wood for contrast against the dark shades. Finish the look with a chandelier made from mason jars. 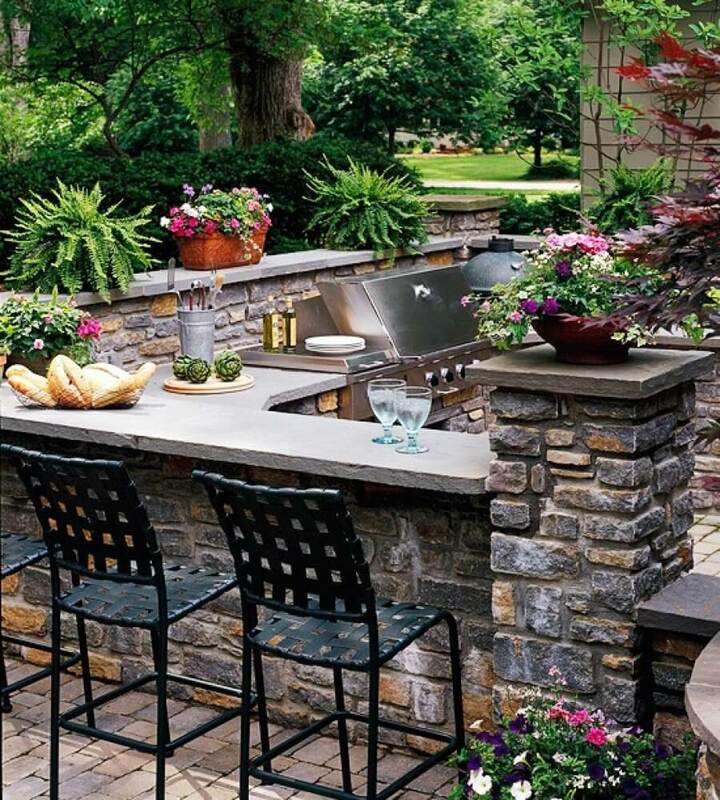 This stonework is a luxe garden style outdoor kitchen. The grill area is almost entirely enclosed with the counter and stone columns on either end provide formal architectural interest. Dark stone is a beautiful, vibrant design that accentuates the flower gardens and greenery. It’s a southern backyard living space. 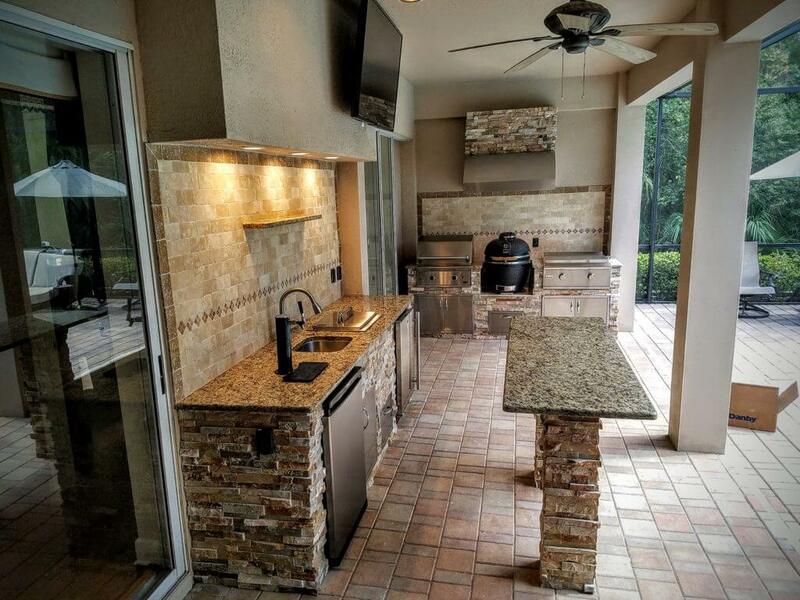 A full patio kitchen provides a grill, sink, fridge, dishwasher, and smoker all in one area. Formal stonework gives the space visual interest, and granite counters add a touch of gourmet. Guests can relax outside with the game on the flatscreen TV above the focal area. Tile the backsplash with a diamond detail across the lower portion, and inset lights add the finishing touch.